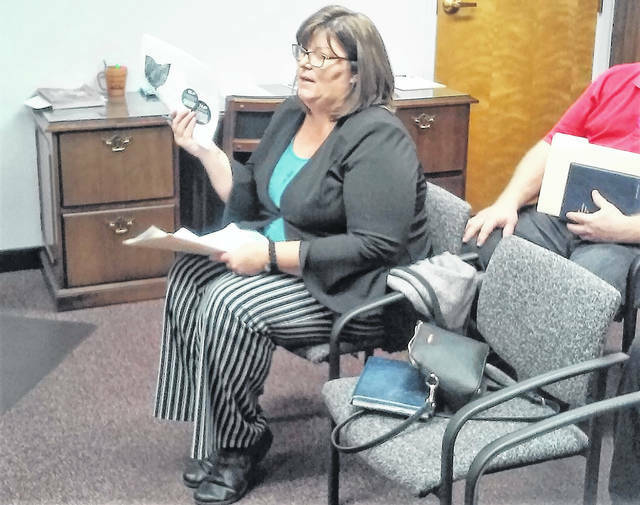 Julia Wise, executive director of the Highland County Community Action Organization, told commissioners at their Monday morning meeting that poverty was increasing in Highland County due to several factors, and outlined how her office is combatting it. Poverty is increasing in Highland County, according to Julia Wise, executive director of the Highland County Community Action Organization, due in part to “some large barriers people face in our county,” which she described to commissioners at their bi-weekly meeting Monday morning. Though the Appalachian region of Ohio has long been associated with lower income and poverty, according to the Ohio Association of Community Action Agencies, only two of the 32 Appalachian counties have shown increases of 10.1 percent or more in poverty: Highland and Ashtabula. At Monday’s meeting, Commissioner Gary Abernathy posed the question as to why poverty is so prevalent, given an improving economy and an unemployment rate that is at its lowest point in half a century. Wise pointed out that child care and transportation are two of the many factors that keep some Highland County residents from rising out of the poverty ranks. She said if a person was working a $10 an hour job and had a preschool child or toddler, even with assistance from Job and Family services, there are very limited child care facilities inside the county. Transportation continues to be a big issue, she said, since many jobs are outside the county, and child care is still a concern. Abernathy asked if the qualifying rules that are in place today are doing more to keep people in poverty, rather than allowing them to leave the relief roles and become productive members of the work world. She said that HCCAO purchased the old Shopco building in Greenfield in 2017 with the intention of addressing those concerns that she pointed out to commissioners, concerns that include housing a child care center and having benefit programs like WIC and emergency services available in one location, with the goal of having the facility open by the end of the year. The meeting was mainly a “state of the organization” consultation where Wise and her board informed commissioners on the agency’s progress and plans for the future. Also in attendance to brief commissioners was HCCAO Director of Community Programs Clint Davis, Director of Early Childhood Programs Valerie Williams, Finance Director Jennifer Baker and Housing Director Mark Current. Also Monday, commissioners met with John Knauff, the new finance officer with the local Amvets, to see if some relief could be given to the veterans’ organization regarding sewer and water bills at the Rocky Fork Lake facility. Knauff told commissioners that from Nov. 1 through April 1, both water and electric service are turned off at their adjacent campground facility. The commissioners said that due to the organization’s lower annual water consumption due to the winter shutdown and recognizing its benefit to veterans, they would put forth a resolution changing Amvets equivalent dwelling unit status from four to three. Equivalent dwelling status, or EDU, is a unit of measure for the sewage generated from particular buildings, structures or uses. In other matters, a pair of resolutions were approved by commissioners, both of which resulted in substantial savings to Highland County. The two resolutions dealt with the early repayment of loans pertaining to the energy efficiency and justice center debts, which commissioner Jeff Duncan said saved the county more than $167,000 in interest. They also approved a two-year renewal of the Tip 411 anonymous drug tip line, which had been a two-year program that came from the now-defunct Rocky Fork Lake federal grant. Commissioners were also signatory to a new three-year operating contract between the sheriff’s office and Aramark Food services for continued food service operations at the Highland County detention facility.